There are two browser icons on the Flip: The BlackBerry browser is located on the home screen, and the T-Mobile browser (really just a shortcut to T-Zones) is in the Main Menu. I really hate to say this, but they are both terrible. Slow, slow, slow, slow. The software is slow, there is serious lag between moving the cursor around and seeing a reaction from the phone, and Web pages take FOREVER to load via T-Mobile's EDGE network. The T-Zones link is the entry point to T-Mobile's mobile portal and gives you access to ringtones and other downloads, as well as your account info and news. The BlackBerry browser takes you directly to the open Internet, though both browsers function in the same way. Using the BB key is the trick (once again) to accessing the menus you need to navigate with the browser. Setting bookmarks and using other navigation tricks is simple once you get acquainted with how BlackBerry's system works. One helpful feature is the ability to copy or send the URLs. Once you have navigated to a page, using the BB key, you can automatically copy the web site's URL, or choose to send it to one of your contacts via email, SMS, MMS or PIN. The BlackBerry browser loads full HTML Web sites. 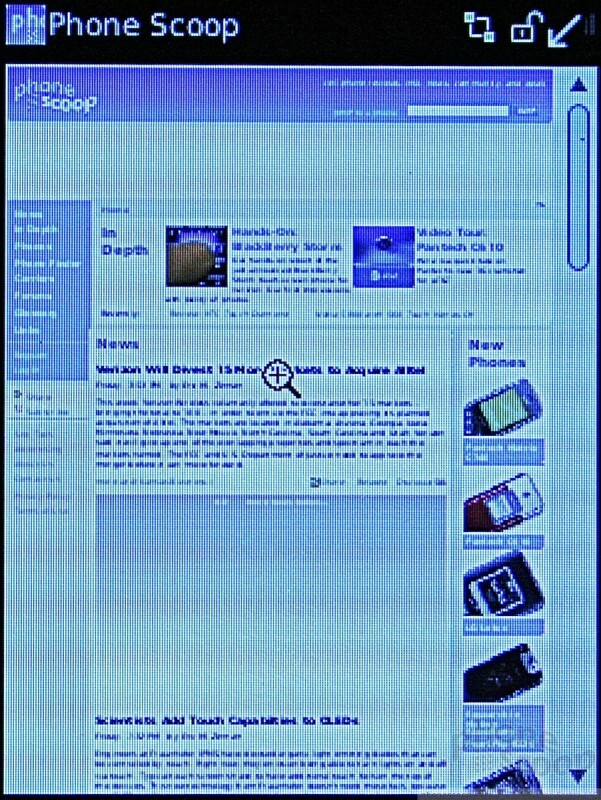 Phone Scoop looked like its normal self through the Flip's browser. Having HTML support is somewhat moot, however, is the device is going to be exceedingly slow to load the Web sites. No matter what network conditions we tested the Flip under, it was very slow to browse the mobile Web. Switching over to Wi-Fi made a huge improvement. I was able to connect the Flip to my protected home network with no problems. Surfing the Web via Wi-Fi was much better than EDGE. The Flip lets you re-arrange the main menu as you see fit. You can hide applications, stuff them in folders, or move them anywhere on the screen. You can set pictures as wallpapers, music as ringtones, and customize how the Flip connects to Wi-Fi networks for UMA calls (which, by the way, worked fine), and configure when the phone goes on/off, turns the radios on/off and so on. You can add words to the dictionary at will, you can tell the dictionary which word to pick more often when you type a key combination that could be two or more words, and make adjustments to how the spell check app functions. Both application keys on the left and right side of the Flip can be customized as short cuts to your favorite or most used applications or settings menu. The options menu lets you alter the phone as you would expect most phones for personalization. You can change the fonts, the size of the fonts, whether or not they are bold and more. This alters the view of your inbox and the majority of the text-only menus you interact with on the Flip a great deal. Because BlackBerries are typically targets business users, there are literally hundreds of ways to configure the phone, set limits, and so on. Most of these will be completely unused by normal people.